Two Dollar Radio, 9781937512651, 236pp. In an age of confusion, fear, and loss, Hanif Abdurraqib's is a voice that matters. Whether he's attending a Bruce Springsteen concert the day after visiting Michael Brown's grave, or discussing public displays of affection at a Carly Rae Jepsen show, he writes with a poignancy and magnetism that resonates profoundly. In the wake of the nightclub attacks in Paris, he recalls how he sought refuge as a teenager in music, at shows, and wonders whether the next generation of young Muslims will not be afforded that opportunity now. While discussing the everyday threat to the lives of black Americans, Abdurraqib recounts the first time he was ordered to the ground by police officers: for attempting to enter his own car. In essays that have been published by the New York Times, MTV, and Pitchfork, among others--along with original, previously unreleased essays--Abdurraqib uses music and culture as a lens through which to view our world, so that we might better understand ourselves, and in so doing proves himself a bellwether for our times. Hanif Abdurraqib is a poet, essayist, and cultural critic from Columbus, Ohio. His poetry has been published in Muzzle, Vinyl, PEN American, and various other journals. His essays and music criticism have been published in The FADER, Pitchfork, The New Yorker, and The New York Times. His first full length poetry collection, The Crown Ain't Worth Much, was released in June 2016 from Button Poetry. It was named a finalist for the Eric Hoffer Book Prize, and was nominated for a Hurston-Wright Legacy Award. With Big Lucks, he released a limited edition chapbook, Vintage Sadness, in summer 2017. 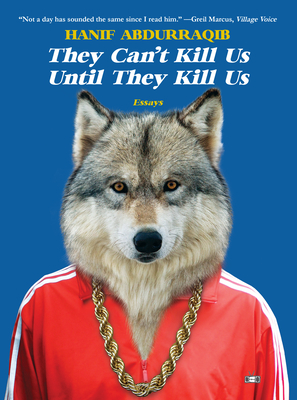 His first collection of essays, They Can't Kill Us Until They Kill Us, was released in winter 2017 by Two Dollar Radio and was named a book of the year by Buzzfeed, Esquire, NPR, Oprah Magazine, Paste, CBC, The Los Angeles Review, Pitchfork, and The Chicago Tribune, among others. He is a Callaloo Creative Writing Fellow, an interviewer at Union Station Magazine, and a poetry editor at Muzzle Magazine. He is a member of the poetry collective Echo Hotel with poet/essayist Eve Ewing.His next books are Go Ahead In The Rain, a biography of A Tribe Called Quest due out in 2019 by University of Texas Press, and They Don't Dance No' Mo', due out in 2020 by Random House.